Don’t ask me why I like going to the thrift store and spending money on things I plan to make into something else. I don’t know why. Although it might have something to do with growing up with a mother whose shopping mantra was “Never pay full price!” Which I don’t. Or at least not very often. 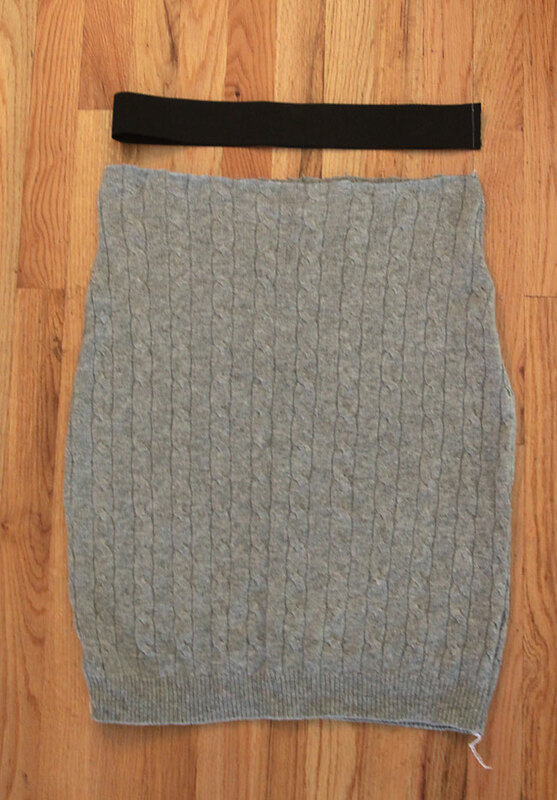 Anyway, I do realize that buying someone else’s cast-off sweater for the express purpose of making a skirt out of it might seem a little odd to some people…or maybe most people…but for some reason that’s just what I like to do. 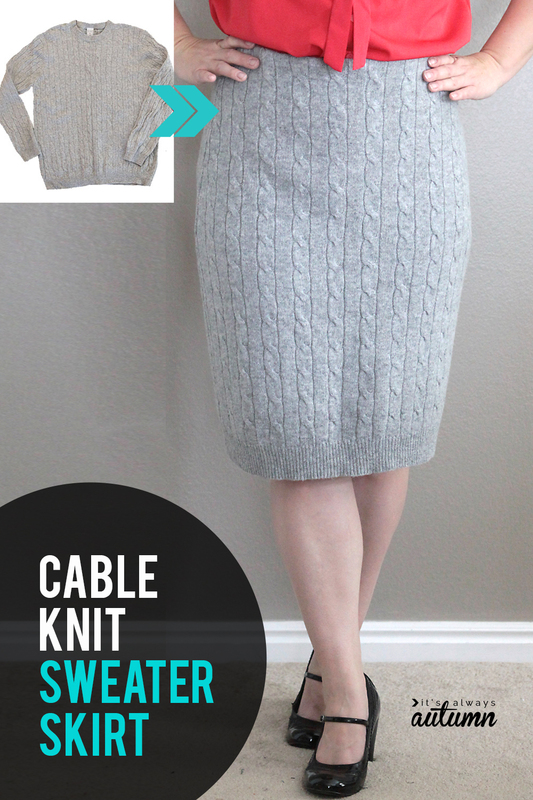 In case any of you happen to be as nutty as I am that way, here’s a quick tutorial on making a very simple cable knit pencil skirt from a sweater. And yes, I’m wearing spanx, because me and stretchy pencil skirts aren’t exactly BFFs. I am against spanx on principle, because really, why should I have to wear uncomfortable stretchy underthings just to make myself look skinnier for other people? Spanx make my inner feminist shudder. 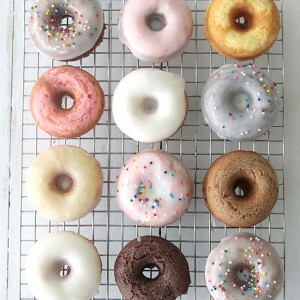 They also make my muffin top a lot less muffin-y. Principles aren’t everything, right? Anyway, maybe we should finally make our way to today’s tutorial. Here’s the sweater I started with (a thrifted men’s L or XL, I don’t remember). Bigger is better to make sure you have plenty of material to work with. Lay out the sweater, making sure the hem is straight across and even (way more straight and even than in this photo) and the sweater is smoothed out flat. 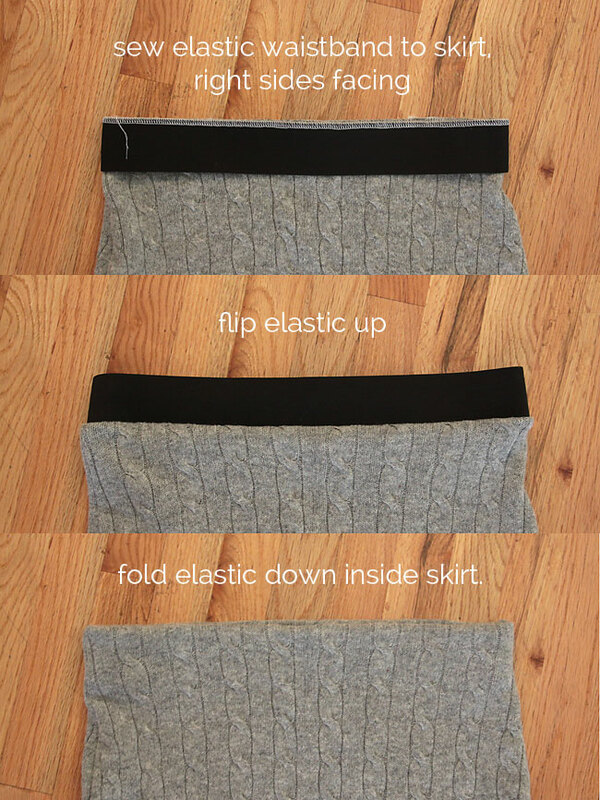 Lay a pencil skirt on top of the sweater and cut around it. Since the sweater is stretchy and the skirt I was using as reference was not, I didn’t worry about adding any seam allowance. If you’re using a tight or stretchy skirt as reference, you will want to add seam allowance. Once you cut around the skirt you’ll have a new skirt front piece and back piece. Place them right sides together and sew the side seams. I always use my serger when I’m sewing on sweater knit, but if you don’t have a serger I’d recommend sewing the seam with a very narrow zigzag, then finishing off the seam allowances with a wider zigzag if it looks like it will unravel. 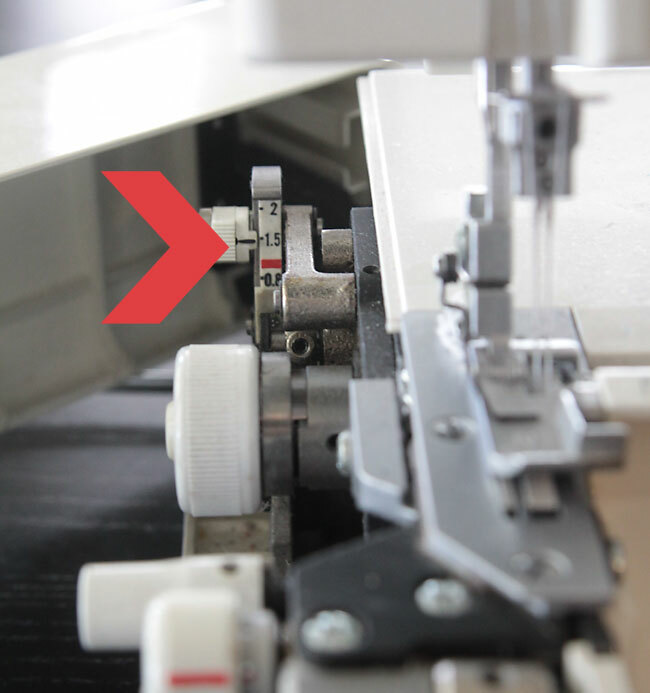 If you find that your material is stretching a whole lot as you sew, giving you a wiggy wavy seam, try changing the differential feed setting – I always increase mine on my serger when sewing sweater knits. Once you’ve sewed the side seams try the skirt on and take it in anywhere you’d like. At that point, cut a length of 2 inch wide elastic just a bit shorter than your waist measurement. (I actually don’t measure – I prefer not to think about my waist measurement in actual numbers so I just wrap the elastic around my waist and pin it where it feels comfortable.) Sew the short ends of the elastic together. Making sure the skirt is now right side out, slide the elastic down over the outside of the skirt, as shown below, and sew the elastic to the skirt, stretching the elastic gently if needed to fit. Be sure to use a stitch with some stretch (zig zag, serge, or double needle). Then you’ll flip the elastic up, then down inside the skirt, as shown in the photos below. Once the elastic is inside the skirt, sew the elastic to the skirt right at the side seams, as shown by the pink dots. That will keep the elastic from flipping back up all the time. This gives you a nice concealed waistband. 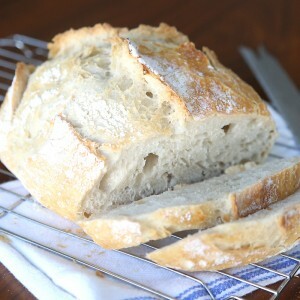 Finish off by pressing all your seams, using plenty of steam. 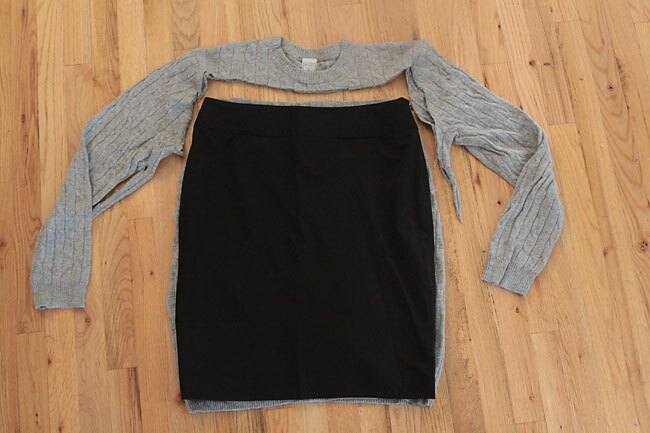 Bye bye old sweater, hello new skirt. Love it….A friend brought over a bunch of sweatshirts in trade for me making her a skirt from jeans,,,I grew up in the 60s and 70s…I do not wear skirts that have a folded over crotch seam…Any way I have made your other skirts from sweat pants…Now I can make a few out of the shirts too…They are so comfy…I live in Montana and they work great, Fall, Winter and Spring…even late evenings in Summer…Keep up the great tutorials……. It is super cute. I think I’ll have a go at it. I think you look beautiful modeling your skirt. But I especially like your shoes! It’s great you repurpose clothes. I stumbled across your site an love it. It’s making me wanting to finish unpacking my sewing stuff. I wear a uniform to work but my sister doesn’t. I really want to make this skirt for her. I’ll have to tell her to go to the 2nd hand store here in town. I’m looking forward to more of your amazing idea’s. ..
You look hot and sophisticated! The tutorial is great, about to try it! 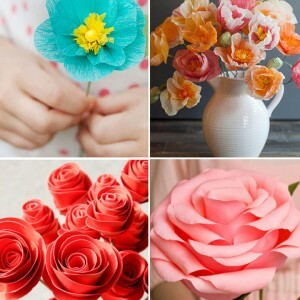 Thank you, love your sewing tutorials! Genius! Thanks for sharing. Shopping this weekend for just the right sweater. 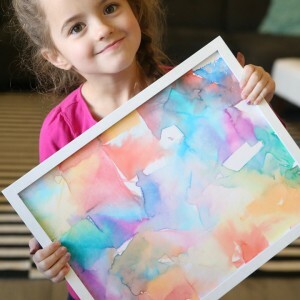 Autumn, your blog is one of my favorites! I love your practical approach to garment sewing & that you have branched into upcycling! Your comments about spanx cracked me up-sounded just like me! But, what we wear is our business, right?! Super idea and it looks great! I especially love it because it’s easy to find oversized men’s sweaters in my local thrift stores, but plus-size work-appropriate women’s skirts are rare and cost 2-3x more in the same thrift stores. 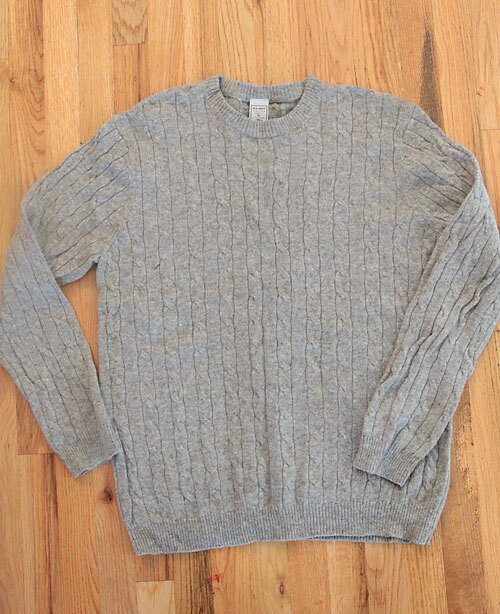 Also, this would work great for a blah color (it just becomes a “neutral”), or an unflattering color (since its not next to the face), or a boring sweater that has an interesting pattern to it like a cable knit. Opens up so many possibilities. I am in the process of making a longish pencil skirt this way. I don’t sew so I use Stitch Witch (tape) and hand sew as needed. This is a light brown on one side and squares of brownish colors on the front side. I saved the neck part and plan on using that for the edging of the pockets to be near the waist in the front. It is going well so far. I don’t have any warm skirts so am trying to make one this way. I enjoyed your tutorial. I use a lot of “up cycled sweaters” in my art business. This idea is super cute and super fast for my fashion at the shows. I am trying it! (PS – I will also be trying the spanx.